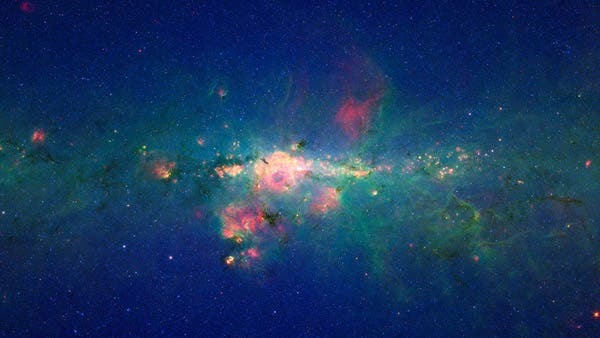 A newly enhanced image from the infrared Spitzer Space Telescope reveals the crowded central region of the Milky Way, inhabited by Sagitarrius A* – our galaxy's supermassive black hole. The new image, which spans a region 2400 light years wide and 1360 light years tall, highlights the galaxy's bright but dusty core, which visible light cannot penetrate. A mass of stars creates a blue haze at the center of the galaxy. Green, carbon-rich dust glitters in the light of neighboring stars, while warm dust exudes a yellow-red glow. The brightest white feature at the centre of the portrait is a star cluster that orbits Sag A*. "The black hole came into existence billions of years ago, perhaps as very massive stars collapsed at the end of their life cycles and coalesced into a single, supermassive object," according to Andrea Ghez, professor of physics and astronomy, UCLA.